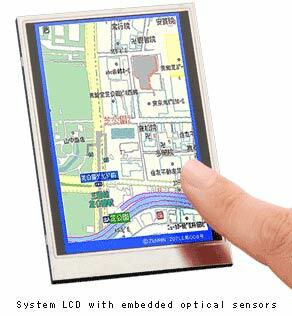 Sharp Corporation has announced a new proprietary “System LCD” equipped with touch screen and scanner functions. The company claims to have successfully embedded an optical sensor, used in devices like scanners, in each pixel of the LCD panel. This technology eliminates the need for films, resulting in a thin clear screen display compared to conventional touch screens. Sample shipments will begin in September of this year, with volume production slated to start next spring. In addition, tactile recognition based on simultaneously touching multiple points on the screen is now possible, a feature previously difficult to implement. For example, users can easily tap the screen with two fingers to enlarge or reduce a displayed map. Also, the scanner function can be used to scan in a business card placed on top of the screen, and further improvements to this function are expected to enable fingerprint authentication in the future.